Is there anything better than the start of a new year? A chance to acknowledge what’s working, what’s not working and really do something about it? I’m a goal setter by nature, always planning, dreaming and making lists upon lists, and there’s nothing like a fresh start to fuel my inner optimist. Last year I set some pretty major goals for myself. I wanted to feel stronger, so I joined the boxing gym. I wanted to finally address questions I’d been ignoring about my faith, so I started actively searching for answers. I wanted to live a life that allowed me to pursue writing, photography and creativity every day and so I quit my full-time job and started Feast + Fable. Overall, I worried less and I did more. I surrounded myself with positive mantras and people that said, “Yes! Go! Jump!” and spent time asking myself questions like, “What are you really afraid of?” and “What’s the worst that can happen?” I read books like “Big Magic” by Elizabeth Gilbert and became a crazy fangirl. I think most importantly, I took my goals and aspirations seriously and I gave them life. I talked about them relentlessly, woke up every morning and journaled about them, prayed about them and didn’t let them slip away. Because that’s what can happen with dreams if we aren’t careful, they will get away from us. And there's nothing worse than watching someone else live out your dreams. I’m going to go against the grain here and invite you to join me in giving 2016 one last chocolatey hurrah before we fully commit to carrot sticks! Because we all know the holidays are a whirlwind and it can be hard to find time to properly thank the year for what it brought us. And if you're already deep into your “New Year, New You” diet, just bookmark this page for a rainy day and check back for some delicious, healthy recipes later this month! As always, thank you for stopping by and following along! This cake is a spinoff from the Chocolate Cake with Basil Mascarpone Buttercream I made earlier this year, and I’m not going to lie, I think I like this one even better. The rosemary is perfectly subtle and pairs so well with the moist, chocolatey cake. The cake itself is not too rich, but wonderfully flavorful and tastes so great with a bite of fresh raspberry! Grease and flour two 8-inch round cake pans. Line the bottoms of each with a layer of parchment paper. In a large bowl, whisk together all the dry ingredients. Then, in a medium bowl, whisk together all the wet ingredients except the boiling water. Whisk the wet ingredients into the dry ingredients and then stir in the boiling water. Divide batter evenly between two cake pans and bake until a toothpick inserted in the center comes out clean. Begin checking for doneness at 28 minutes. Let cool in the pans for at least 10 minutes, then turn the cakes onto a lightly greased cooling rack. In a medium saucepan, melt the butter over medium heat. Add the rosemary sprigs and muddle gently. Reduce the heat to low and cook, stirring often, for 15 minutes. Remove from heat and let sit until cool. Once cool, strain out the rosemary sprigs and transfer the butter to a bowl. Set in the refrigerator for 5-10 minutes or until the butter is partially firmed up. Transfer the butter to a large mixing bowl and give the butter a few folds so that it’s evenly creamy. Once creamy, beat the butter with the mascarpone and gradually mix in the powdered sugar and salt. Once your cakes are fully cooled, level them. Place one layer on a cake board or stand and spread a thick layer of frosting on top. Place the other layer (cut side down) on top of that. Using an offset spatula, frost the cake smoothly all over. For more of a naked look, frost the top and simply smooth the excess frosting around the sides adding more to fill gaps or even out. 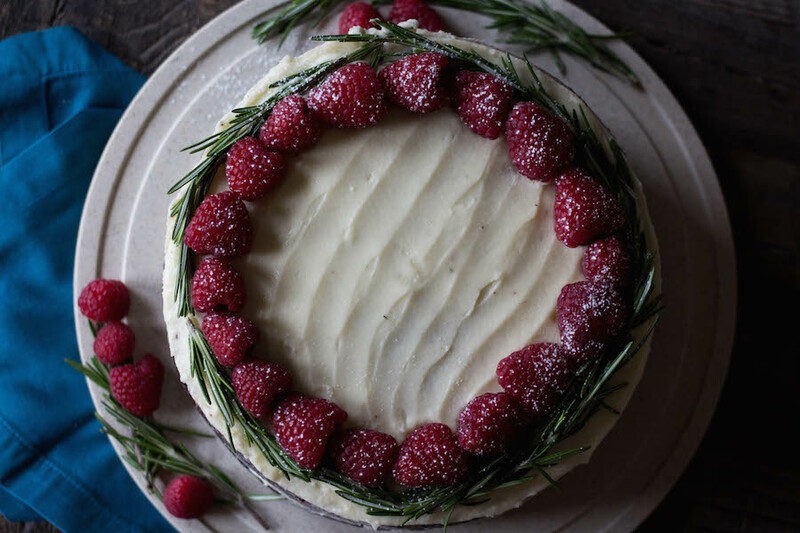 Decorate with rosemary sprigs and raspberries and enjoy!